I just finished “Small Steps” by Peg Kerhert and it was sad and exciting at the same time. It is about peg when she was younger and got polio. She went to 2 hospitals and got diagnosed with 3 different types of polio. You should read it if you like to read about someone’s problems. I just read a book by Peg Kehret. 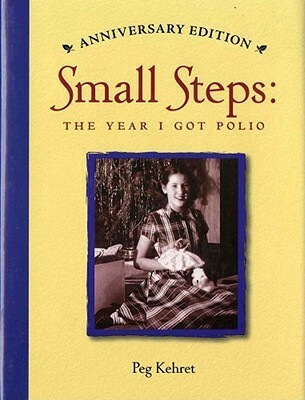 The book is “ Small Steps: The Year I Got Polio.” You should read this book if you like excitement but also sadness. This is a true story about the author Peg. Peg was only 12 when she was diagnosed with polio and had to go to two hospitals. She could not move any part of her body except her head. She had to do a lot of special exercises that she called “Torture Time.” She had a difficult time but got through it and made many hospital friends. If you like Humor, Excitement, and Sadness then you should read this book!